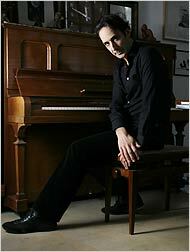 I was delighted when The New York Times asked me to write a piece about (then up-and-coming) composer Alexandre Desplat. At the time, he was much talked-about for his scores for The Queen (shortly to be Oscar nominated) and The Painted Veil (shortly to win the Golden Globe). This story also appeared in the International Herald-Tribune. Director Stephen Frears is always fun to interview; he’s so down-to-earth and practical about music. This entry was posted in Composers, Film Music, From the Files, Interviews and tagged Alexandre Desplat, Golden Globe, Jonathan Glazer, New York Times, Oscars, Peter Webber, Stephen Frears, The Painted Veil, The Queen on January 8, 2007 by Jon Burlingame.